The Highlands Company believes that people are happiest when they live, study, and work by using their strongest abilities. To do this most effectively, they need to know and understand their natural talents and abilities, as well as the other seven factors, which combine to make the whole person. The seven factors are your skills, interests and fascinations, personal style, values, goals, family of origin, and your stage of adult development. The Highlands Company is the creator of the Highlands Ability Battery, which contains nineteen different hands-on work samples, each assessing and defining a different individual ability. It is an excellent assessment tool in its objectivity and its range. An individual who completes the Battery receives a detailed report and a 2 hour follow-up feedback with Rick. Every individual who completes the Highlands Ability Battery receives a thirty-page report which begins with an individual Bar Chart and Profile. 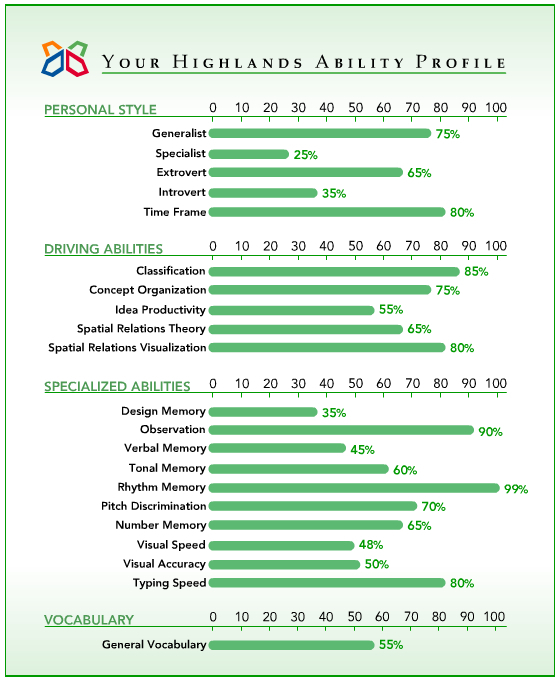 The Bar Chart is divided into three sections —Personal Style (Generalist/Specialist; Extrovert/Introvert; Time Frame orientation); Driving Abilities (Classification; Concept Organization; Idea Productivity; Spatial Relations Theory; and Spatial Relations Visualization); and Specialized Abilities (Design Memory; Observation; Visual Speed, etc.). The Bar Chart shows the individual’s score on each worksample, expressed as a percentile of all persons who have completed that worksample. The extended report which follows the Bar Chart explains the significance of each worksample and of the individual’s percentile. Individuals are divided into low, medium and high percentiles. The Bar Chart and report must be read and analyzed together. This sample Bar Chart appears here to give you a reference of what you can expect. This test is taken on-line. You will have to contact Rick to get the codes to enter the Highlands’ website to take the test. It takes about 3 hours to complete. You will receive your results immediately. After you have had time to read your results, contact Rick to set up an appointment for him to interpret and personalize the test findings with you.